We’re told it matters, from the time we’re little girls. We’re told our appearance determines at least some of our worth. And we’re told that we need to do a whole lot of nipping, tucking, and makeup-ing in order to truly be beautiful. …but is it really all safe? Are the things we do in the name of beauty really healthy for us, physically and otherwise? Time to bust some beauty myths! The cosmetics and personal care industry is basically unregulated. Ingredients that are banned in other countries, and that are known carcinogens (that is, they cause cancer) are allowed in makeup and all kinds of other products. Most makeup is tested only to see if it clogs pores — and some isn’t even tested for that. Mineral makeup is much safer, but even that isn’t completely safe. (Many use bismuth, which some say is dangerous.) It’s hard to find safe makeup, and really best for our skin to go without — but many women aren’t comfortable with that. I’ve purchased makeup from Bare Minerals (some say they’re not the best, though) and Redeeming Beauty Minerals. In our bodies, our lymphatic system helps to carry toxins and waste products from our organs, out of our bodies. When we wear tight bras, it restricts the flow of lymph, which can lead to build up. Some say that this is a cause or contributor to breast cancer! Plus, push-up bras can raise heavy breasts up higher, causing back problems. It’s best to wear a soft cotton bra that supports breasts gently, without restriction — and go bra-less when you can (at home, or at night). Ladies, I know many love the look…but no. High-heeled shoes are terrible for your feet, legs, and back! They put all your weight on the balls of your feet, instead of distributing it evenly. They misalign your legs and hips, too. Over time this can cause serious damage to your feet, legs, hips, and low back. My chiropractor has shown me images of women who’ve worn high heels regularly over time — they’re scary! He’s very much against them (as are female chiropractors I know). They’re best saved for rare occasions or even skipped entirely in favor of low-heeled, fancy shoes. I’m not a big fan of “permanent removal” of any body parts…no matter how seemingly unnecessary. We have hair on our bodies for a reason. It protects our bodies, helps us regulate temperature, and more. (We don’t yet know all the functions.) Permanently removing it is a bad idea! Instead, shave or pluck or use other non-permanent forms of removal, so that you always have the option to grow it back. When I was driving the other day, I saw a giant billboard advertising sweat-stopping injections. It claims to permanently kill the lymph nodes under your arm that make you sweat. Eep! This is a really terrible idea. We sweat to remove toxins and waste products from our bodies. If we can’t sweat, these toxins build up over time — which could contribute to cancer. We should never block our body’s natural detox pathways! Instead of stopping sweat, try this natural clay deodorant, which will absorb the sweat and toxins, leaving you feeling fresh…and actually helping your body. There’s an ingredient called phenylenediamine ( PPD), which is in most permanent hair dyes…even natural ones. It can cause allergic reactions, and can sensitize your skin with multiple applications. Some say that it may even be linked to cancer. Hair dyes also contain ammonia and peroxide, which can be dangerous. It’s safest to skip the hair color, or look for a natural, food-based dye. There are several more natural dyes on the market now that don’t use the most dangerous chemicals. I know, the postpartum body is not what you thought it would be, sometimes. (Join the club!) But, shape wear’s more trouble than it’s worth. When you wear very tight undergarments — which is what shapewear is — it pushes your fat in towards your organs. This can cause nerve damage, reflux (from the fat pushing your stomach up), and more. It can even lead to varicose veins, UTIs (if you don’t remove it to use the bathroom when you need to), weakened muscles, and even blood clots! They make you “look good,” but they’re just not worth it. Most people aren’t desperate enough to actually go for this option, but some consider it. However, it will backfire. First, there’s the obvious risk that surgery poses — the recovery time, risk of infection, possible blood clots, and so on. But there’s more. Liposuction comes with risks like uneven skin, damage to the skin and nerves, and even damage to the internal organs. Plus, your body isn’t really made to go through dramatic weight loss like that, and it throws off the homeostasis your body has. Liposuction is very dangerous! All of those over-the-counter acne spot treatments…they’re based on salicylic acid. It’s related to aspirin, so it’s not safe for children. Salicylic acid is supposed to prevent pores from clogging, leading to clearer skin. It only lasts as long as you use it, though. It also may cause sun sensitivity and allergic reactions. Better ways to unclog pores are to use clay-based facial masks weekly (you can make your own), and wash your face regularly with warm water and finish with cold water. Skip makeup or heavy lotions whenever you can, opting for a light lotion instead. Try this acne salve. Most shampoo contains a chemical called Sodium Laureth Sulfate, which is a harsh detergent and which has been linked to cancer and cell damage. Shampoos can also strip your hair of moisture, and use other harsh chemicals to make them shiny — but which can lead to hair loss over time. Look for a quality natural shampoo without these ingredients in them, or use a mix of baking soda and water. I have done baking soda at times, and have been using this shampoo for about a year now. Some people have hair that tends towards being dry — and conditioners are necessary to help their hair feel softer, less brittle, and not so dry. But, some of the commercial brands have silicone and other non-natural substances that can, especially if overused, damage hair. Deep conditioners can actually weaken hair and cause it to break, and lose its normal texture. Natural deep conditioners, like avocado oil, coconut oil, egg yolks, jojoba oil, shea butter, aloe vera — are all a good idea. Mix some together (it’ll vary depending on your hair type) and leave on no more than 30 minutes for soft, shiny, yet strong hair. If your hair tends to be oily, you shouldn’t need this at all. This is probably the most important lie that women are ever told. Ladies. You do not have to reach some ideal in order to be beautiful. You do not have to be skinny. Or have to have perky breasts. And you do not have to be tall. There is nothing that says you have to be anything in order to be beautiful. So the “industry” wants to convince us we need to be thinner, smoother, flawless. We don’t. They say that to sell us products, to make us feel inferior so we want to buy what they’re selling in order to make ourselves “better.” Better…? No. You’re beautiful just the way you are. Beauty really does come in all shapes, sizes, and colors. There’s no one “right” way, no ultimate standard. There is just not. And no. There’s absolutely nothing wrong with being skinny, tall, and in general conforming to what society thinks is best. That’s not better, and it’s not worse. Many naturally thin women feel like we’re beating up on them when we start talking about “real women” that are heavier or curvier. There are no “real women,” ladies. We’re all real women. What’s the worst beauty myth you’ve heard? Laser hair removal isn’t even permanent. Hormones control hair growth and your hormone levels will fluctuate throughout your life so no matter how many laser treatments you have, the hair can still grow back. I love this list Katie, because so many women really do believe these myths. You could make an entire list on just makeup also, I don’t know how many times I’ve heard women say they “need” mascara because their eyelashes are thin or they “need” eyeliner or you can’t see their eyes or they “need” lipstick because their lips are so thin. When did our world become a place where painting our faces was something needed? 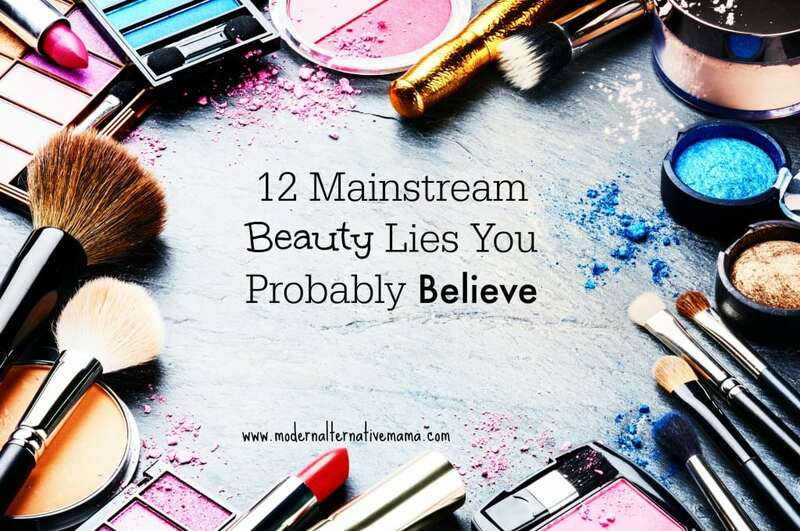 It surely comes from the unrealistic airbrushed beauty standards of the entertainment industry hand-in-had with the corporate advertisement agencies that have such great success releasing new products each year because beauty products never truly satisfy a woman’s desire to be more beautiful. Probably because she is constantly trying to change the way she looks instead of appreciating and emphasizing her natural beauty. I learned the hard way that the best way to enhance my appearance is to stop trying to change it and to just take good care of my skin and hair.